The sewage system was designed to dispose of specific things. However, many people now use their toilets for the disposal of many modern day household products. Over several years “flushable” products have become prevalent. These products are labeled as disposable or flushable and unfortunately are not biodegradable like toilet paper. 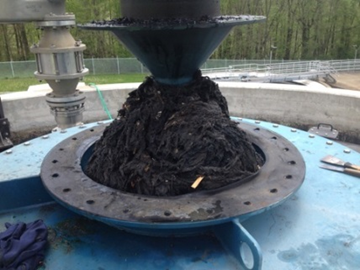 This can cause clogging pipes and have the potential of sewage backups into homes. Many products that are flushed down the toilet do not pass easily through the pumps and can get trapped on the impellers of the pumps, creating maintenance and operational problems. These products can also cause problems with mechanical equipment at the sewage treatment plant and are necessary to remove during the treatment process. -Baby wipes, disinfectant wipes, moist wipes, etc.